Web News System: 'Genetics have a dark side': Trend of gifting DNA tests might be more of a curse than a joy this Christmas, ethicist warns. 'Genetics have a dark side': Trend of gifting DNA tests might be more of a curse than a joy this Christmas, ethicist warns. Giving a relative an at-home genetic testing kit this holiday season may be more of a curse than a gift, experts warn. 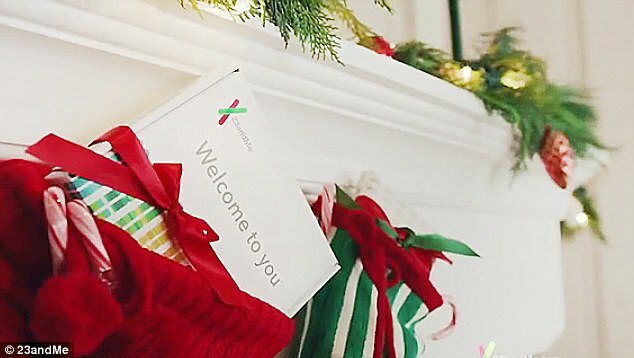 Genetic testing companies like 23andMe have been offering holiday discounts and marketing their kits as ways to bring families closer by learning more about their shared genes. More than two million people have purchased tests from 23andMe alone, telling them information about their genes ranging from innocuous traits like cleft chins to whether they might pass a predisposition for Alzheimer's to their children. Curiosity about family ancestry and genetics is natural, but ethicists point out that at-home tests reveal information that's not to be taken lightly, and don't come with a genetic counselor to interpret the results. In one of its holiday TV advertisements, 23andMe promises its tests will 'bring the ones you love, even closer,' as diverse families hug and greet one another. But at home genetic testing could tell you what you don't share with your relatives, as well as what you do. Furthermore, what to do with the information can be a divisive question for families. The desire to gift the tests is 'a certain amount of just curiosity: "why do I have red hair when mom and dad don't," and little sort of family secrets might be found out in a fun way,' says Dr Arthur Caplan, a bioethicist at New York University. Earlier this year, Jaclyn Baxter of California took a 23andMe test, and found out that the father she'd grown up adoring was not her biological parent. She was happy to discover three half-siblings, but the process certainly came with some trauma. 'The American people have been sold on the ancestry part [of genetic testing], but it's not being treated seriously,' he says. Consumers can choose to purchase kits with out without the ancestry battery of tests, but the combination - currently marked down to $149 from $199 - is 23andMe's most popular variation. 'I think ancestry reinforces stereotypes and doesn't give you anything useful, since biology doesn't verify your cultural and social categorization,' Dr Caplan says. CAN THIS TEST PREDICT WHETHER YOU WILL GET A DISEASE? The genes analyzed by 23andMe are not enough to predict whether or not you will get a certain disease. Rather, the test will be able to show if you have an increased risk. For most people, the science will not be conclusive enough to generate a percentage risk factor. Even for those that do have risky gene mutations, their risk will still be low. The N370S variant in the GBA gene increases one's risk of Parkinson's three-fold. However, the average risk factor is 0.3 percent. That means the increased risk factor would still be less than 1 percent. Senator Schumer has asked the Federal Trade Commission to investigate the data protection policies of genetic testing companies. Results from at-home genetic tests give information about the genes you carry, but 'you don't have anybody to counsel you or help you' understand the results, says Dr Caplan. The genetic tests from 23andMe have been FDA-approved to screen for predispositions for a number of diseases, but genetics are not the sole determining factor for developing something like Parkinson's or Alzheimers. But results from different companies like Helix, 23andMe and Color have been inconsistent, Dr Caplan says, calling their accuracy into question. Dr Caplan worries that people will discount the importance of lifestyle and environmental factors to overall health in light of genetic results. If your goal is to keep your loved ones healthy, instead of giving them a genetic test, 'talk to your [family] about exercise, diet, climate change, pollution, wearing a seat belt or bike helmet and getting enough sleep,' says Dr Caplan. 'Then, they'll be fine and you'll be $100 richer, or whatever it costs,' he says. 'If you have $150 and want to give a gift, it's probably better to give a membership to a health club. They'll get more out of it and maybe continue going,' he says.